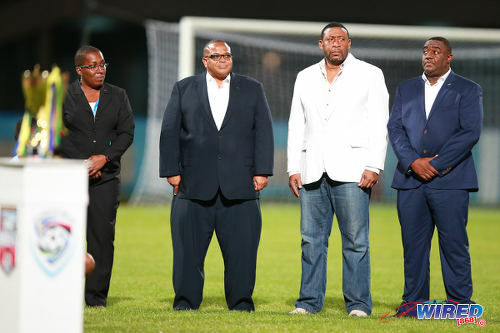 Is Trinidad and Tobago Football Association (TTFA) president David John-Williams still the right person to take the local sporting body forward? Or should John-Williams, as suggested by board member Keith Look Loy and former World Cup 2006 manager Bruce Aanensen, step aside for the good of the game? Wired868 asked Northern Football Association (NFA) president Anthony Harford, Central Football Association (CFA) general secretary Clynt Taylor, Pro League CEO Julia Baptiste, Eastern Football Association (EFA) president Linus Sanchez, Veterans Football Foundation of Trinidad and Tobago (VFFOTT) president Selby Browne, Southern Football Association (SFA) president Richard Quan Chan and Secondary Schools Football League (SSFL) president William Wallace for their thoughts. 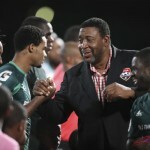 Wallace declined comment as he said the SSFL is, at present, holding internal discussions regarding the happenings at the TTFA. And Quan Chan did not respond to our attempts to reach him. 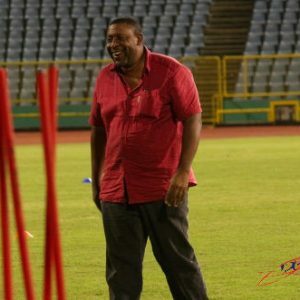 However, Browne was forthright, as he referenced John-Williams’ recent acrimonious public exchange with US Chargé d’Affaires John McIntyre—after the Trinidad and Tobago Women’s National Under-15 Team were denied visas to participate at the 2018 Concacaf tournament, due to the football body’s late applications. McIntyre accused John-Williams of trying to mislead the public and said his unprofessionalism was affecting the future of talented young local players. Browne said it was damning stuff and scoffed at the TTFA president’s suggestion that Concacaf move tournaments from the United States, when the two island republic was the only Caribbean nation that failed to get their visa applications done in time for the Florida trip. Taylor, the CFA general secretary, said his body did not support a move to replace John-Williams last year. However, the recent occurrences are pushing him to rethink that position. “I don’t like to do things like these where I’m calling for the resignation of a president and so on,” said Taylor, who unsuccessfully challenged John-Williams for the presidency in 2015, “because I believe that once in power you should be given a chance to serve your term. But we’ve reached a point now where we are being embarrassed on the international stage […] and we have to be careful. Baptiste would not be drawn on whether or not John-Williams deserved to keep his post. Instead, she sympathised with the Under-15 players, who missed a chance to wear national colours for the first time. 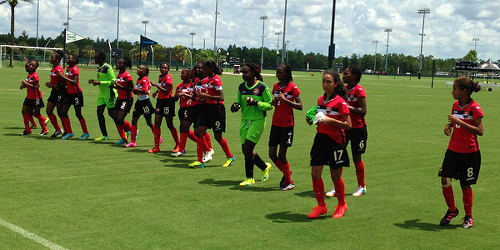 Photo: The Trinidad and Tobago Women’s U-15 Team warm down after their 4-0 win over the Dominican Republic on 10 August 2016 in the Concacaf Championship. The Women’s U-15 Team were forced to miss the 2018 Concacaf Championship due to the TTFA’s late application for visas. Harford suggested that a lack of available information has become a staple of John-Williams’ presidency; and it does not reflect well on the TTFA boss. He pointed to the TTFA’s US$2.25 million FIFA-funded Home of Football contract, for which John-Williams has refused to produce contracts and receipts for examination by the board or members. “I was [John-Williams’] number one supporter but I cannot support what is passing as leadership right now,” said Harford. “His leadership style is absolutely tyrannical; this is a person who lacks any moral compass. Up to now, David cannot produce contracts for the Home of Football project. (Harford disclosed that his own All Sport Promotions organisation was liaising with creditors and, inch by inch, paying clubs what they are owed for the 2016 Super League season). 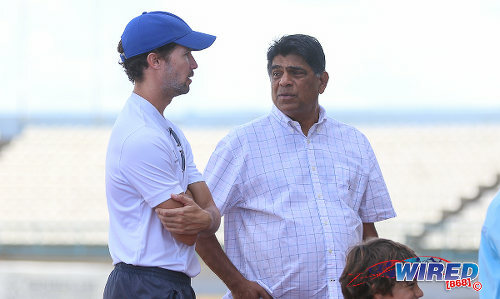 Photo: All Sports Promotion director Anthony Harford (right) chats with a football coach during RBNYL action at the Larry Gomes Stadium on 18 March 2018. The NFA president’s view on John-Williams’ financial transparency was not unanimous, though. 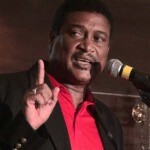 Sanchez, the EFA president, said John-Williams answered all Look Loy’s questions at the TTFA’s Extraordinary General Meeting (EGM) on 13 June. But what about Look Loy’s attempts to view the Home of Football contracts and related invoices himself—which have been repeatedly blocked by John-Williams? Harford suggested that, despite the verbal promises that Sanchez referenced, John-Williams was not true to his word. 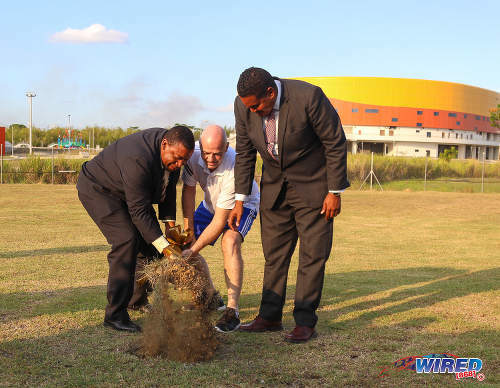 Photo: FIFA president Gianni Infantino (centre) and TTFA president David John-Williams (left) turn the sod at the Ato Boldon Stadium in Couva on 10 April 2017 while Sport Minister Darryl Smith pretends to help. The CFA official felt John-Williams should not shoulder all the blame for the TTFA’s failings, though. “His heart is in the right place but that doesn’t mean he’s the right man for the job,” said Taylor. “He must be commended for the noble idea of the ‘Home of Football’ project; but outside of that he has failed miserably. […] You can’t be a good leader and just focus on that one thing. “His problem is that he doesn’t trust the persons around him to carry out certain duties and he’s trying to do it all by himself… David isn’t alone in this. What are the VPs doing? What are Joanne Salazar and Ewing Davis doing? Sanchez suggested that John-Williams’ critics are in the minority and calls for his resignation were premature and would probably prove futile. Harford and Browne agreed only that John-Williams will not go willingly. 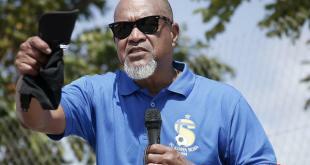 “The TTFA president will not resign,” said Browne. “He has adopted the same modus operandi as his predecessors. He has aligned himself to derive benefits from the FIFA president for his personal gain, certainly not for the benefits of local football. “[…] At the moment our football is going nowhere, it’s going absolutely nowhere. How many players do we have in the English Premier League? Harford, who said he was one of the first supporters of John-Williams’ successful presidency bid in 2015, does not think there is enough impetus to shift the TTFA boss. “David’s arrogance is built on one thing alone,” said Harford. “He plays the political game so strategically and he knows that he has the numbers on his side to survive any vote of no confidence from the membership. 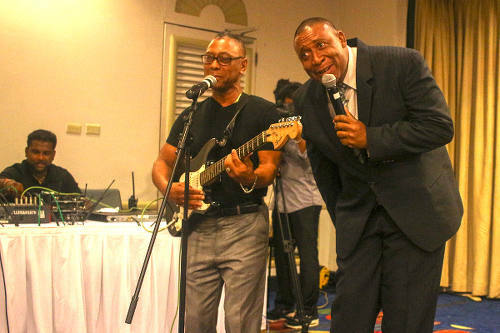 Browne hopes that the next TTFA AGM spells change and he urged like-minded people to stand up to John-Williams. The announcement of USA, Canada and Mexico as co-hosts for the 2026 World Cup, he opined, was an opportunity that will go to waste if stakeholders did not act immediately. 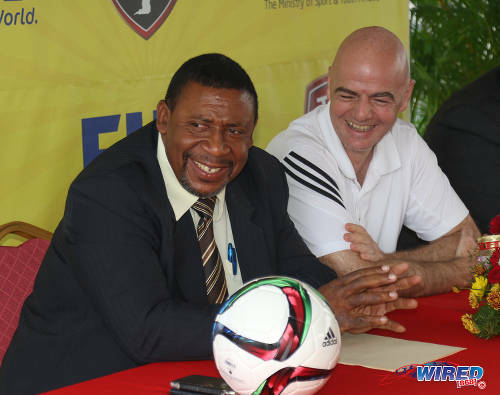 Taylor hopes the end is near for the TTFA president. 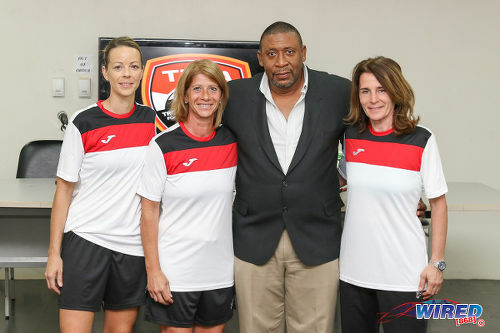 “We must change the way we manage and operate football in Trinidad and Tobago,” said Taylor. “We need to get the corporate sponsors and the man on the street involved before we can see change. This administration has shown that it is not prepared to handle the functions they were appointed to carry out. 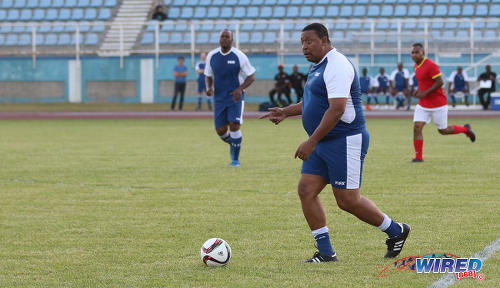 Harford described John-Williams as a poor imitation of disgraced former FIFA vice-president Jack Warner. The current TTFA boss, according to the NFA president, is just as shifty and selfish; but lacks Warner’s charm and savvy leadership. Harford said he shudders to think of what further damage John-Williams and his cohorts could do with another 15 months in charge. “David’s tenure has been lacklustre, disingenuous and unimaginative,” said Harford. Taylor had the last word. Happy Independence Trinidad and Tobago and Happy Birthday! Let us see how dumb Look Loy and company are if they cannot use this to their advantage if they really want to solve this problem for the country.